what a great title to hold! 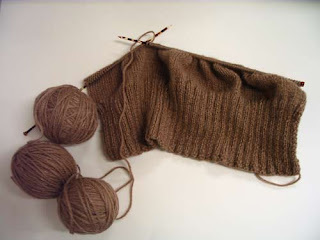 I was on the Historic Fibers blog and checking out the links on the right nav bar. There is a big pile of awesome knitting history links and I thought I would share them with you all. Firstly is The Hook and The Book virtual exhibition. An awesome and comprehensive resource from what looks like a museum exhibition. Filled with pictures of historical examples of knitting and crochet, lots of explanations and links to other places. A great place to spend some time. Next is the Victorian and Albert museum in London. They have a knitting section here where you can look at their knitted items and even submit photos of your own! I think that is kinda cool, submitting your stuff to become part of the V&As digital collection. 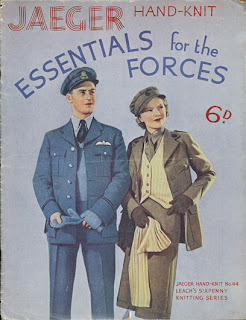 They also have a range of 1940s patterns that are free to download here. The Essentials for the Forces booklet cover comes from that page. I love the look on the woman’s face! Determined and thoughtful but also a little cross. Speaking of old knitting patterns, Sarah’s homework site is one lady’s project of scanning in and uploading heaps of old patterns, i think from a book she inherited, but I could be way off there. Another site that’s doing much the same thing is Vintage Purls There’s some gorgeous items you could make at home including my favourite, this little fairy toy. I think making a fairy that someone a few generations ago created to delight children back then would be joyous. And to round things off, an essay about knitting during wartime called Knitting for Victory, which is where I got the title of the post from. I find it fascinating that at several points in history, it was considered a woman’s patrotic duty to knit knit knit. It’s just such a different society now, we’re not really called upon to do that. However, having said that, the excellent Pip and the Handmade Help crew restashed crafters and encouraged the donation of handmade goodies for the bushfire victims, so maybe it’s now more a grassroots urge of helping community rather than a governement spearheaded operation for troops at the front. Which reminds me, that HBOs Pacific comes out soon, and there will be a scene of picnicking families and sweethearts and somewhere in those groups will be a lady knitting about 5 inches of olive drab ribbing for a jumper on tortoiseshell needles while she sits and watches children play. That, my friends, was my first ever war effort. Nowhere near the amount of effort that Anthea Chrome did knitting all the outfits for Coraline, but still, it’s the second biggest piece of clothing I’ve ever knitted, and even then I didn’t finish it. As the lady handed it back to me at the end of the day, she said “I’m sorry, I think I dropped some stitches. I’ve only done about 3 rows.” She was dreadfully concerned. I smiled and said that it didn’t matter. It was, after all, only a prop. But still, I like to think about it as my first war effort!